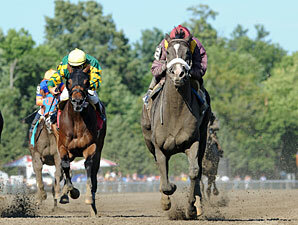 Last Friday marked the start of the 143rd summer meet at Saratoga Race Course. For the next six weeks horse racing fans from all over the country will be focused on what many believe to be the highest quality racing meet in North America. On tap at the Spa will be a total of 17 Grade I races and over $24 million dollars in purses. While much of the lead up to this year’s Triple Crown was typified by injuries and a general lack of a standout horses – bettors and fans are hoping that the results of this year’s Saratoga meet will give the 2011 racing season more definition and shape before the Breeder’s Cup in November. Even though Saratoga is famously known as the “graveyard of champions”, a quick look at recent developments indicate that this year it may be a place for previous champions to regain their former glory. Let’s start with Uncle Mo. Last year around this time, he was just a 2 year old baby who was getting to know the game. When he made his debut on the undercard of the Travers Stakes, he rocked the Spa by breaking his maiden by more than 14 lengths. Following an outstanding performance in the Breeders’ Cup Juvenile without breaking a sweat, Uncle Mo was by far the most popular horse in America with huge star potential. However, a disastrous performance in the Wood Memorial would change Uncle Mo’s plans for Triple Crown glory. After the discovery of a rare liver disease, he never made it to the starting gate at Churchill Downs. At the crack of dawn last Friday morning, Uncle Mo came back to the track with his first published workout since his pre-derby work in May. Todd Pletcher is now in the processes of getting Uncle Mo ready for the Grade I King’s Bishop on Aug. 27, the premiere sprint race of the summer. Another comeback in the making played out on Friday’s opening day card, when Jackson Bend got his first victory since 2009 in the James Marvin Stakes. This tough little horse, who is known for giving his all in each and every race, had a grueling campaign in 2010 leaving him a bit washed out when he returned this year. Beaten by less than a length by Lookin at lucky and First Dude in the Preakness, Jackson Bend is making his comeback in the sprint ranks. Smart handicappers who zeroed in on Jackson Bend as their selection were rewarded with a generous $18.80 for a $2 bet. Trainer Nick Zito’s next challenge for this horse will be to get him ready for the Grade I Forego Handicap on September 3rd. Great article ! – Very helpful…. Thanks ! !